The Dehiding system is designed for automated pelt removal in the inverted position from a variety of species including, Sheep, Lambs, Goats, Calves and Deer. The F.E.A. 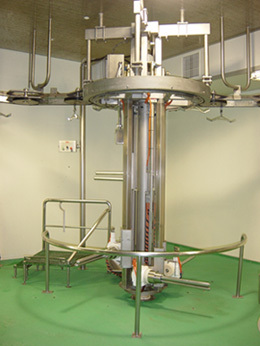 Small Stock Processing System incorporates the FEA Dehider, which is an automated skin removal machine specifically for removing skin from the neck of the animal downward and off the back legs. 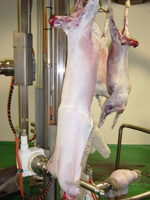 This unique machine slowly removes the pelt from the animal with none to very little damage to the pelt or carcass. Pelt damage under manual pelting and conventional dressing can be significant. 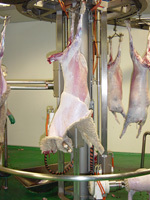 The FEA Dehider is only for Inverted dressing lines, meaning the animal is hanging from the front legs during skin removal. Dehiding systems are installed in Australian Domestic and Export plants. These include EU & USDA listed. Other installations can be found in New Zealand, Asia, Middle East and Europe. 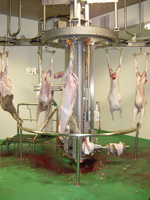 The FEA Dehider is not for conventional dressing systems, conventional meaning animals hanging from back legs during skin removal process.